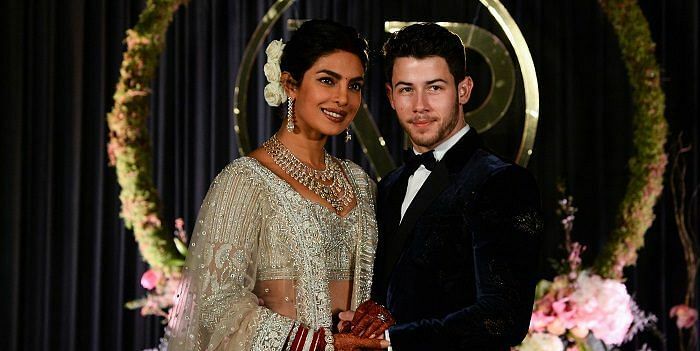 Oh, you thought Priyanka Chopra and Nick Jonas‘ wedding was over? That’s cute. The newlyweds are actually still celebrating their new union in India, and in fact, they just stepped out for their official reception in New Delhi. The reception is taking place at the Durbar Hall in the Taj Palace Hotel in India’s capital city, according to local media. It’s a fitting regal venue for the couple, who just married at another royal location: the Umaid Bhawan Palace in Jodhpur. 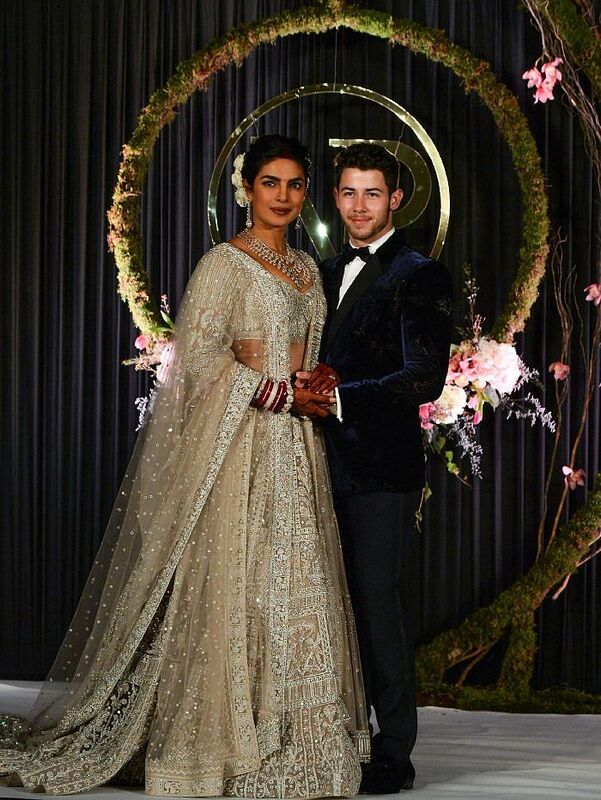 Nick and Priyanka posed in front of their massive joint “NP” monogram upon arrival. Chopra looked dreamy in a shimmering white lehenga, reportedly by Falguni Shane Peacock India, decked out in elaborate beading and embroidery. She also wore dangling diamond earrings, a luxurious necklace, and flowers in her hair for a romantic touch. Nick looked dapper in a velvet suit and bowtie by her side. News of the couple’s reception arrives just after photos from their intimate ceremony were published by People. The couple tied the knot with both a Christian wedding on Saturday and a Hindu wedding on Sunday, honoring their diverse backgrounds. Chopra’s glittery reception dress is also the latest of her breathtaking bridal looks. For her Western wedding ceremony, she donned a hand-beaded and hand-embroidered dress with scalloped sleeves and a high collar, custom-made by Ralph Lauren. The look was embroidered with names and phrases with importance to the bride, including her husband’s name, parent’s names, and anniversary date. But the real scene-stealer was her massive, royal-wedding-worthy veil, which was 75 feet long. For reference, Meghan Markle’s was 16 feet long. You do the math. For the Hindu ceremony, Priyanka wore a custom look by Sabyasachi, an acclaimed Indian designer with an elegant take on tradition. She wore a striking red lehenga, which took 3,720 hours and 110 embroiderers to create, and Mughal-inspired jewelry. Prior to their actual nuptials, the couple also hosted a pre-wedding mehendi and sangeet, where Priyanka also showed off her epic bridal style. How many more looks does she have coming?